Launched in 2013 as the first in NEC PE series, the NP-PE401H is billed as an “entry-level” data projector. That means it’s fairly affordable, starting at $1,999, while delivering high-impact performance. For presenters, the PE401H is a solid projection tool. 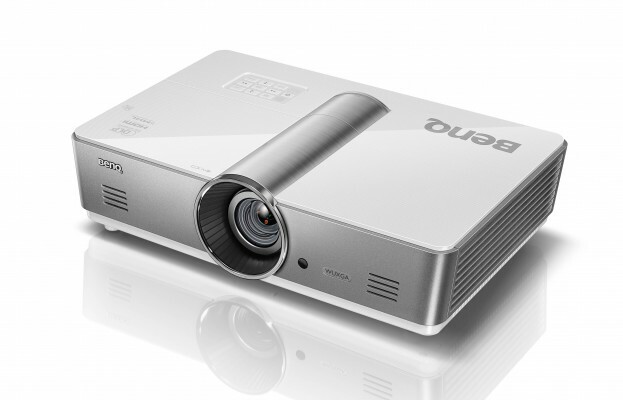 The projector provides a 4,000-lumen, Full HD image, in the 16:9 aspect ratio (compared to the typical 16:10 for data projectors). That alone is one reason the projector stands out, but there’s also a wide range of functionalities and features. For instance, the NP-PE401H delivers up to 3,300 hours of lamp life – which is above average for Full HD projectors, and will save you on a replacement lamp – plus, it can accommodate data from almost any source. There are two HDMI ports, an S-Video port and composite video port, as well as a USB-B port. Schools, churches and mid-sized conference spaces looking for a projector – particularly those that rely on video – should consider this projector. Great Image Quality: The NP-PE401H is all about image quality. Backed up by BrilliantColor technology, the color saturation is lush and vibrant. 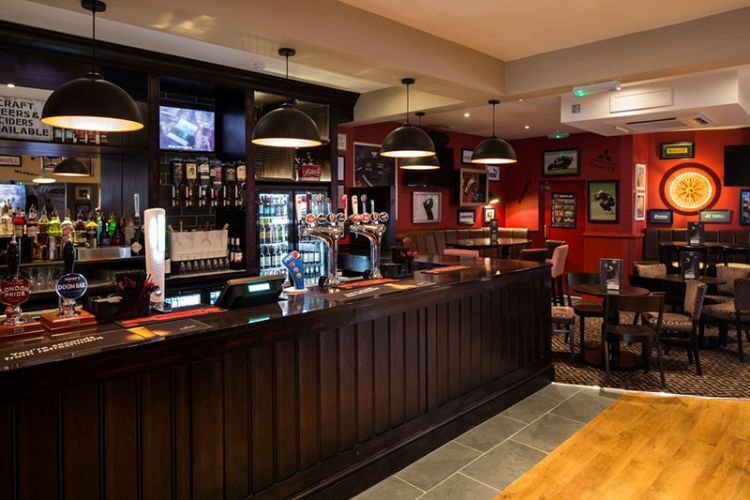 Plus, the image is crisp and detailed, with a 2,000:1 contrast ratio. The clarity of black-on-white text is near-perfection, and the technology delivers great detail in pictures, which is ideal for medical diagrams, architectural drawings or other images with fine detail. Full HD Video, 3D: Although it’s not built as a video projection tool, the NP-PE401H is very capable. It delivers Full HD 1080p video, so you can plug-and-play a Bluray player via an HDMI cable. Plus, it’s capable of providing basic 3D content. In other words, this isn’t a replacement for your home theater projector, but if you’ll be using video clips and short videos in your presentations, the NP-PE401H delivers. Unfortunately, 3D glasses are not included. Large Image Projection: The NP-PE401H is designed to project images up to 300 inches diagonal, which is more than sufficient for most classrooms. Even when projecting an image that large, quality keeps pace, with only slight issues visible. With a picture of about 150 inches, though, the image quality is stunning. Long Lamp Life: Full HD LCD projectors, in general, have long lasting light sources. That’s certainly true in the NP-PE401H. The projector’s 330-watt bulb achieves 2,500 hours of life in the standard mode – just above average for similar projectors – and it’s capable of up to 3,300 hours. Fortunately, the NEC NP-PE401H replacement lamp – part No. NP24LP – is a low-cost investment, helping to save on maintenance costs over the life of the projector. Sufficient Sound Quality: The projector is equipped with a dual 8-watt speaker system, and that’s extremely useful for multimedia presentations. The speakers deliver decent audio, enabling presenters to plug-and-play without having to connect to an external audio source. Installation Flexibility, Portability: The projector weighs about 10 pounds, which isn’t exactly ideal for ceiling mounting, but it still remains portable. 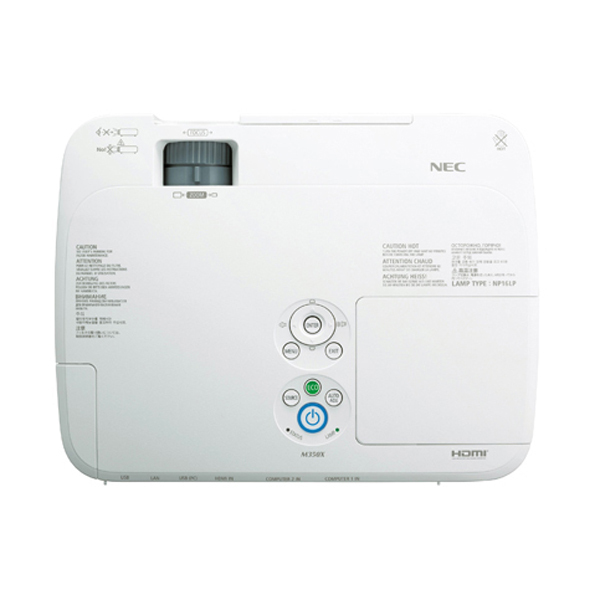 NEC labels this a tabletop-front or table-top back projector, meaning it performs well when sitting on the table of a boardroom or a classroom desk. Yet, it also performs well on a cart. Without lens shift, though, installations do need to be precise to achieve maximum results. 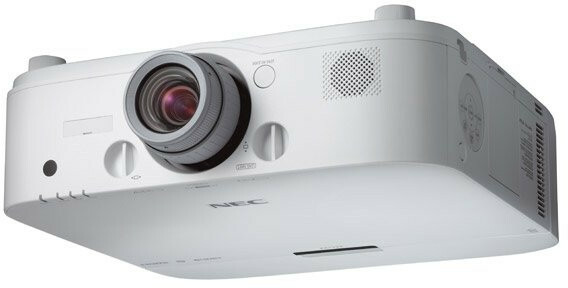 Bottom line: If you’re looking for a projector for a small or mid-sized venue, the NEC NP-PE401H is a reliable and powerful tool. The image quality is stunning, the features are on point with similarly priced projectors, and NEC has a reputation for building high-quality A/V tools. Plus, the price, although a bit higher than some budget projectors, is in reach for most organizations. The NP-M300X is built for vibrant, color-saturated presentation. It’s equipped with a 3,000-lumen lamp, achieving stellar image performance in standard office lighting. Plus, it can accommodate a variety of video formats, the projector is super portable, and it’s built with a wide range of ports. The only downside, really, is that the technology is a little aged. It remains a great projector, but yet, it’s missing features you’ll find in the replacement NP-M322X, like increased brightness and contrast, enhanced audio and auto keystone correction. Suitable Brightness for Presentations: The 3,000-lumen rated NP-M300X provides substantial brightness and a wide brightness range. In the standard mode, the projector is powerful, and if you were to project a 100-inch image in normal ambient light, you’d achieve a crisp, clear image. There are two addition eco settings, Eco 1 and Eco 2, which are reserved for lower ambient light and for displaying smaller images. Depending on the mode you use, the NP-M300X has a range of about 1,300 to 3,000 lumens. Plus, it’s consistent brightness, with no dim or brighter areas, even in zoomed settings. Extended Lamp Life: Equipped with a 180-watt VIP lamp (Replacement Part No: NP15LP), the projector’s lamp has an average life of 5,000 hours in standard mode. In eco settings, lamp life is extended up to 6,000 hours. That keeps maintenance costs low, which is another reason this is such a useful piece of A/V equipment for schools and businesses. Quality Image and Video Performance: NEC’s 3LCD technology is designed to provide powerful image, and when it was first released, reviewers raved about data image performance. It has a native XGA resolution (1024×768), a 2,000:1 contrast ratio, and delivers vibrant colors with excellent saturation. For presentations, that’s exactly what you’re after. Plus, the M300X can accommodate a variety of video formats, from 480i to 1080p Full HD, and performance is consistent, especially for a projector that’s not designed for video. In other words, for the occasional classroom movie, the M300X is a viable option. 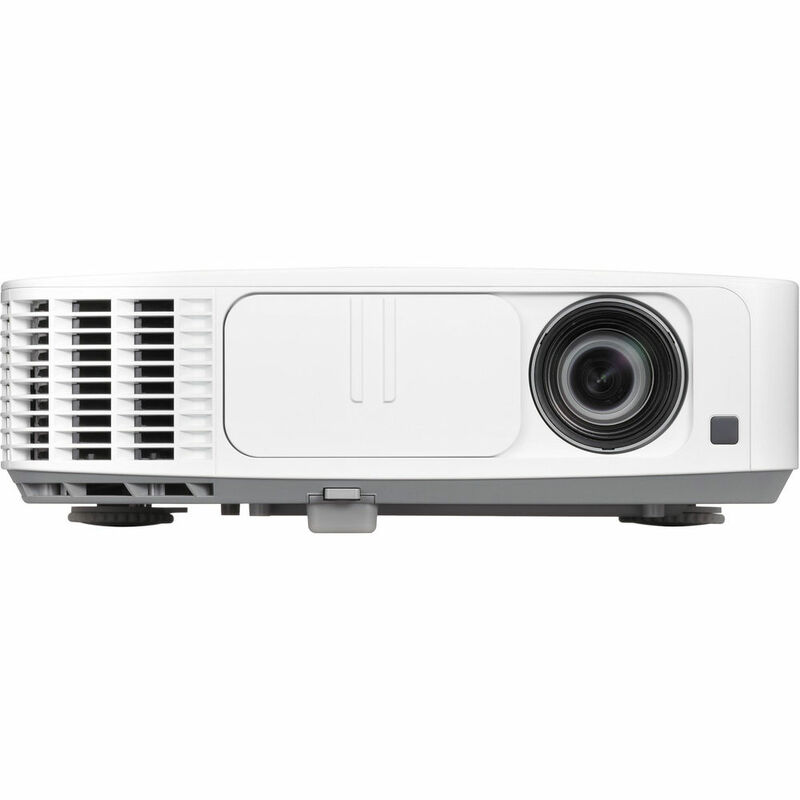 Available Connections and Set-Up Flexibility: Compared to today’s projectors, the M300X is a little behind the times, but yet, it features a decent range of connection options and a few useful image correction features. For instance, it has 1 HDMI port, both USB A & B connections, and 2 VGA ports. Plus, it has a zoom ratio of 1.7:1 and vertical keystone correction. Newer models have a bit more selection, as well as features like auto keystone. Is the M300X still a reliable choice these day? Yes, the M300X remains a capable projector, but only if the price is right. Currently, its replacement the M322X, which is actually two generations removed from the original, sells for about $650 in North America. Thus, that should be your benchmark. If you can find a quality, used M300X in the range of $300, that’s an incredible deal. Plus, with M300X replacement lamps costing around $200, you can have a near-new set-up for less than today’s version. In reality, there aren’t too many features that separate the M300X and the M322X. The newer version has improved brightness at 3,200 lumens and a much greater contrast ratio. Plus, it has improved audio – 10W compared to 20W speaker – as well as auto keystone and useful networking features. But for basic classroom or business presentations, those features wouldn’t be missed. Thus, if you’re on the market for a used or refurbished projector, the M300X might suit you well.